This seems like coming. Small things had been adding up and it seems that the ruling AKP party in Turkey finally pushed too much. 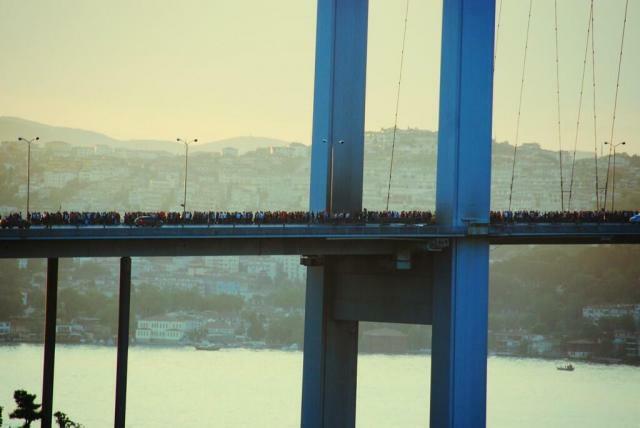 If you haven't seen the news, anti-gvernment protests have engulfed Istanbul and have reached other Turkish cities as well, including the capital, Ankara. The center point Istanbul is Taksim Square which is not only the heart of the city but also the usual place for political protests. 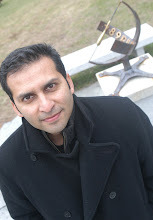 I have been to Istanbul multiple times (I was there at this time last year) and have friends and family there. In fact, on most occasions, I have stayed quite close to Taksim. On the one hand, it is heartbreaking to see pictures of police throwing tear-gas canisters at the protestors and pepper-spraying them. 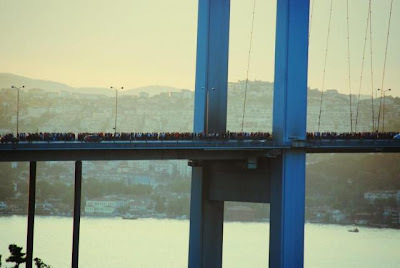 On the other hand, it is also rejuvenating to see throngs of people crossing the bridge over the Bosporus on foot (public transport was suspended to stop the protestors) to stand in solidarity with the protestors at Taksim Square against the increasing overreach of the government. This city is indeed alive! Violent protests against the government of Prime Minister Recep Tayyip Erdogan engulfed this city on Saturday, as thousands of demonstrators took to the streets and alleyways in a second day of civil unrest and faced the tear gas and water cannons of a harsh police crackdown. to remake a city park in Taksim Square into a replica Ottoman-era army barracks and mall, the move that set off the initial protests earlier in the week. For many demonstrators, however, the protest has moved beyond that project and become a broad rebuke to the 10-year leadership of Mr. Erdogan and his Islamist-rooted Justice and Development Party, which they say has adopted authoritarian tactics. 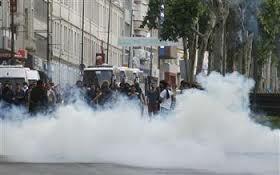 Mr. Erdogan, in his first comments on the growing unrest, seemed determined to maintain the aggressive police response. His only conciliatory note was to promise to investigate claims of excessive police force against peaceful protesters on Friday that resulted in nearly 1,000 injuries, according to the Turkish Doctors Association. 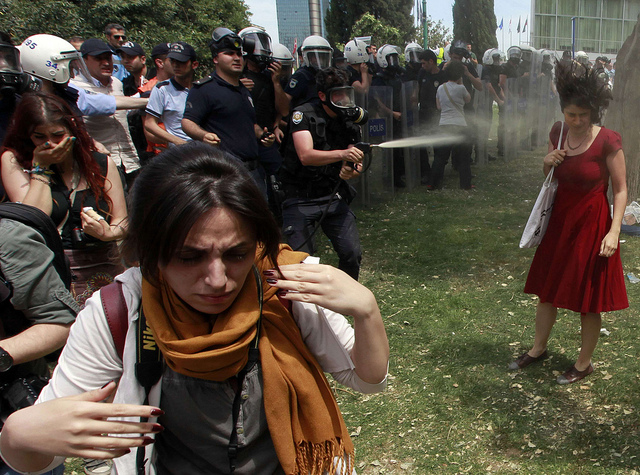 “The police were here yesterday, they will be there today, and they will be there tomorrow in Taksim,” Mr. Erdogan said. In late afternoon, the police withdrew from Taksim Square and allowed tens of thousands of protesters to gather there unhindered. By evening, no police officers were in sight, and most of the protesters were gathered on the lawns of the square, some drinking beer, others chanting antigovernment slogans. Throughout the Arab uprisings, Turkey remained ostensibly stable. Some commentators proposed Turkey as a model for post-uprising Arab states, most especially Egypt. The mixture of a “moderate” Islamist prime minister and a "secular" constitution made NATO-member Turkey an attractive prototype for a new Middle East in the eyes of Western pundits. Others, along with myself, have pointed out that Turkey is a poor choice of role model, given its ongoing conflict with its Kurdish minority population as well as myriad other dynamics. Today, it seems as though Turkey's internal divisions are surfacing in a way not seen for some time. 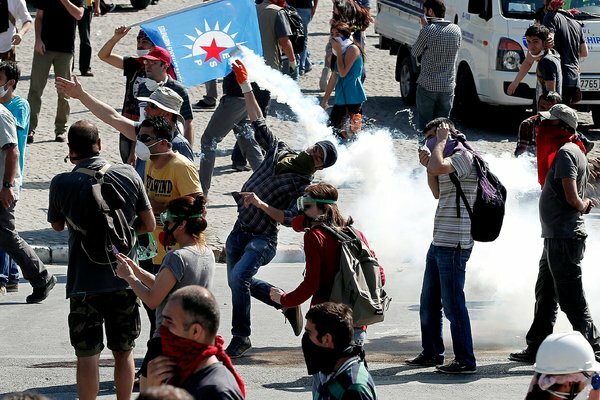 What we are seeing in the Gezi Park occupation is the sudden explosion of this Right to the City movement, with some general anti-government sentiment mixed in. For now, an Istanbul court has temporarily suspended construction of the park, pending a hearing on the matter. 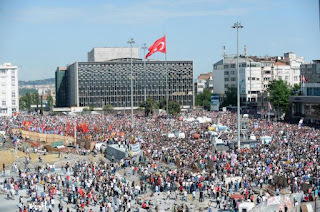 As time goes on, and if this movement continues to grow, rifts are likely to occur and the meaning of the protests will become as contested as the physical space of Taksim Square. But for the time being, between the massive May Day protest and now this nationwide movement less than a month later, we may finally be in for a summer of uprising in Turkey.